Review posted June 3, 2016. Scholastic Press, 2016. 439 pages. This is a grand and ambitious cycle of books. 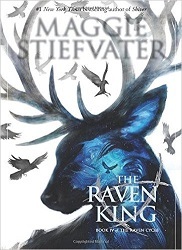 Maggie Stiefvater’s writing is lyrical and evocative. The story is unlike anything I’ve ever read -- ley lines running under Virginia, a family of psychics, a girl who magnifies the magical gifts of others, a man who’s part tree, a rich private high school student searching for a long dead Welsh king who will grant wishes, another boy who can dream things up – and make them real. And then there’s the curse that if Blue kisses her true love, he will die. And the blooming romance between Blue and Gansey, that rich kid searching for the long-dead king. I liked the voice in which the book is written. I like the way the author focuses on different characters by turns, starting new chapters with the words, “Depending on where you began the story, it was about…” about many, many different characters. All that said – and I certainly was going to read every word of this book after reading the earlier three volumes – this is not my favorite kind of fantasy. I like fantasy books where the magic makes logical sense to me, operates by rules. The magic in this book seems much more nebulous and hard to follow. There’s also a whole lot of darkness here, along with gory death. And yet the author pulled off a satisfying conclusion. Well, maybe it was a slight let-down. Since I didn’t fully understand how the magic worked, I was a little befuddled by how all the plot threads wrapped up – but mostly satisfied. And did I mention the wonderful writing? Yes, the story’s dark. Yes, it’s confusing in spots, but you will be pulled along into this world and into the lives of these characters, flawed but lovable, muddling through, trying to make sense themselves of some powerful magic. This series isn’t one I’ll necessarily ever read again – but I thoroughly enjoyed the time I spent with it.